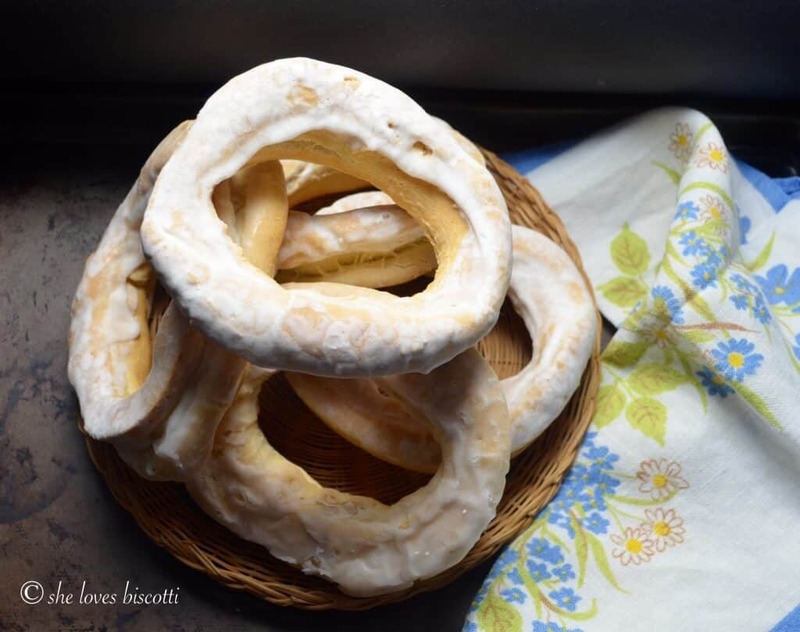 These easily identifiable Glazed Italian Egg Taralli have always been considered an Easter specialty. 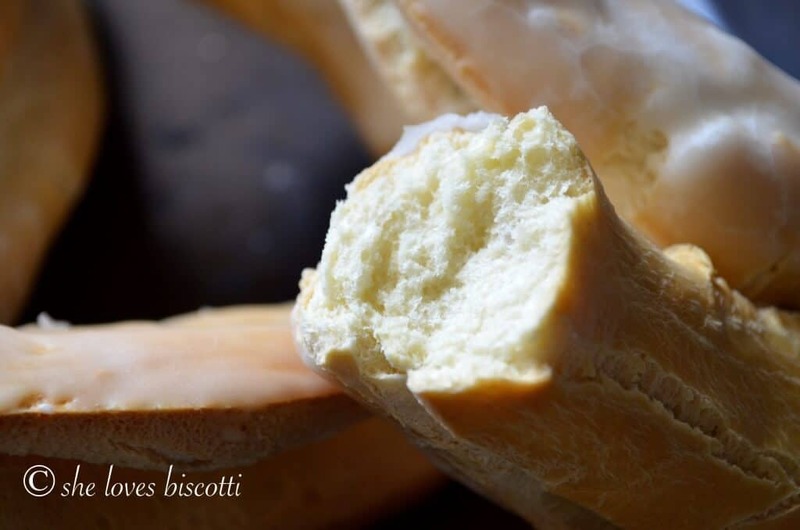 In recent decades, they have become so popular that they can easily be found year round in Italian pastry shops, in and around the city, right here in Montréal. There really are so many variations of this simple snack food, which, as you may know, has its origin in Southern Italy. I have to admit, I have a couple of “food obsessions” and taralli are definitely one of them. 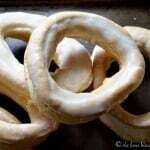 I have already shared a few recipes for savory taralli (fennel and anise), a Italian Wine Biscuitsand, of course, my grandmother’s taralli, which are my absolute favorite. 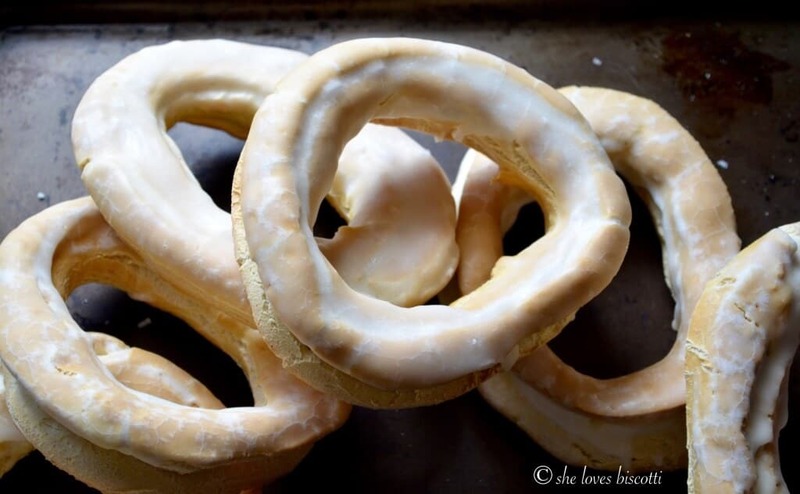 Today, I will share this recipe for a Glazed Italian Egg Taralli, which is a little bit different than all the others. A quick look at the ingredients will indicate there are only a couple of tablespoons of sugar for 3 ½ cups of flour. These taralli are really not considered “sweet” by any stretch of the imagination. However, that sensation of sweetness is still there, thanks to the glaze made with icing sugar. 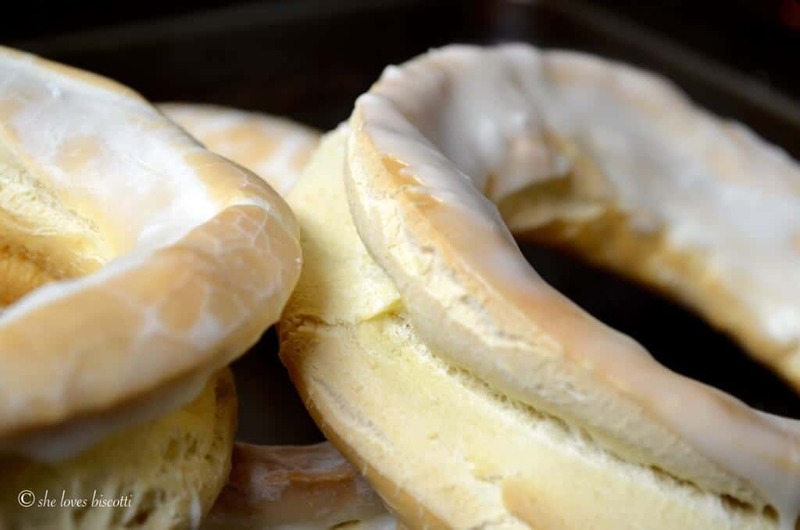 This white glaze, which is so characteristic of this taralli, is what sets it apart from the others. 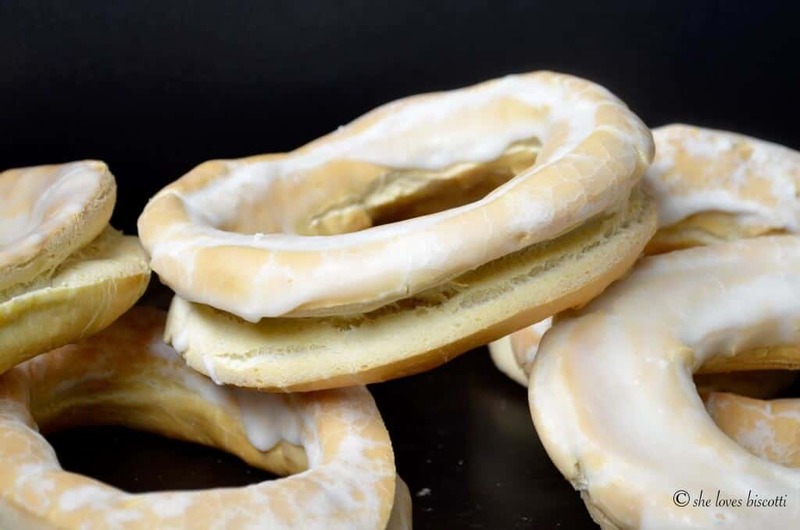 These particular glazed taralli have a hard crust with an extremely light and airy interior texture. 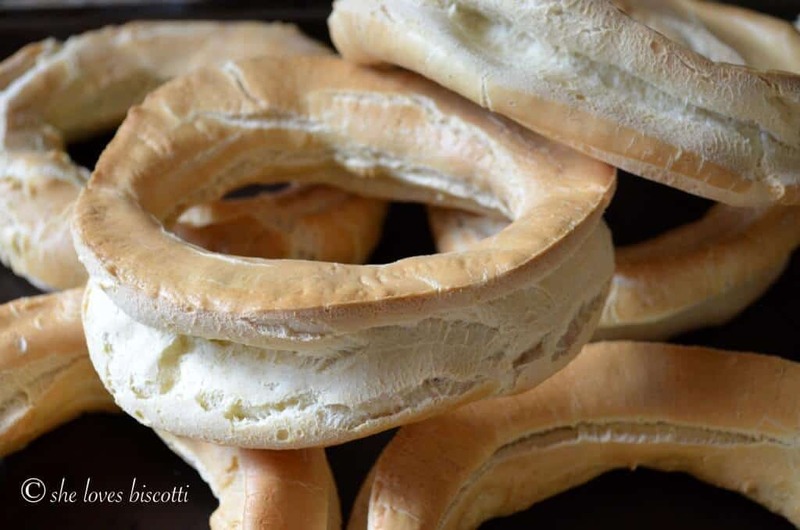 The shape of taralli is usually the same, despite the fact there may be some variations in the ingredients (for example: yeast, wine, or liquor) and/or in the procedure (for example, boiled or not). For this particular recipe, once the ingredients have been combined, the dough is allowed to “rest” for a certain period of time. The taralli dough is then formed into the classic taralli shape; they are then boiled, scored and baked directly on the oven grates. In my Italian upbringing, the frenzy of Easter baking was equivalent only to Christmas baking (not to mention those special occasions like graduations, showers, engagements, and weddings). For some religious groups, certain foods were restricted during the Lenten period. One such food was eggs. And so, as a result, eggs (which symbolize rebirth) played a very important role in Easter baking. As an example, there are Easter breads baked with whole eggs nestled in the dough. Another example would be the Italian Colomba (which is a dove-shaped panettone). Other baked goods would include recipes for savory and sweet Easter pies. I’ve already shared with you a few of my family’s Easter baked goods. And so you can well imagine that Easter celebrations involved lots and lots of eggs. A few weeks ago, I walked into a pastry shop in the east end of Montreal and I noticed these Glazed Italian Egg Taralli on the shelf. My intention was to purchase the bag, but once I picked it up, I thought to myself, this is wrong… I need to make my mom’s recipe. It took some deciphering on my part – all she ever wrote in her recipe book was “add as much flour as necessary” – but after about a half dozen failed attempts, I can honestly say that I am finally happy with my results. 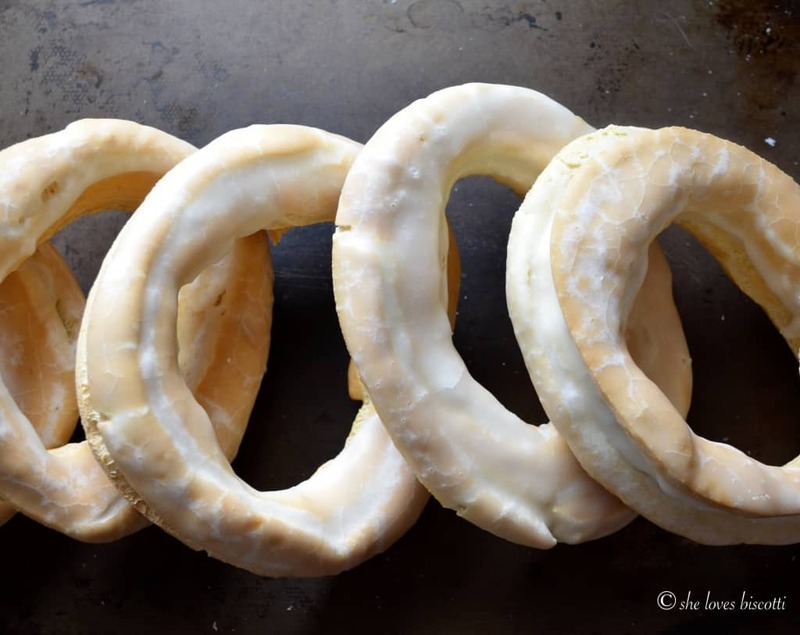 And so as I continue in this quest of mine to try to document as many of my family’s old recipes as possible, I am very happy to share with you this recipe for these Glazed Italian Egg Taralli. This family recipe for these Glazed Italian Egg Taralli will provide you with a firm exterior crust, but a very airy and light interior. In a large mixing bowl, sift together flour, baking powder and salt. Set aside. In a large mixing bowl (of stand mixer), with whisk attachment, beat the eggs on medium-high speed for 4-5 minutes. Add sugar and continue to whisk for about 2 minutes. At this point your whisked eggs should be thick. Add oil, vanilla extract and lemon zest. Continue to whisk together. Add sambuca to this egg mixture and whisk together. On low speed, add about 1/3 of the flour mixture. Switch to dough hook and incorporate the remainder of the flour. Knead for approximately 10 minutes. Form into a log; wrap dough in plastic wrap and let it rest for at least 30 minutes at room temperature (I will usually place a tea towel over the top). Cut dough into 8 pieces. (Begin by cutting the log in half; and repeat 2 more times. You will end up with 8 pieces of dough). Work with one piece of dough at a time; keep the rest of the dough covered. With thumb and forefinger, pinch the middle to create a hole. Slowly enlarge the hole, while forming a donut shape. Continue to form the rest of the dough. Bring a large pot of water to a 200°F. (What we want is really hot water with a couple of bubbles escaping from the surface). Place the taralli in the water and remove with slotted spoon once they rise to the top (about 3 minutes). Make sure they do no stick to the bottom of the pot. (Remember the water is neither boiling, nor simmering...it's just really hot). Score the exterior of the taralli. Bake in a preheated oven at 375° F (180° C) for 10 minutes, then reduce to 325° F (160° C) for another 20-25 minutes until cracked, golden brown and light to the touch. (Set oven rack in the center). If you find they are getting too dark, place a sheet of aluminum foil loosely over the top. Combine all of the ingredients for the icing sugar in a medium saucepan over lowest heat. Whisk together for 30-60 seconds. Brush the tops of the taralli with the glaze or place directly in the saucepan; remove, flip over and let air dry on cookie rack. You need to work fast as the glaze is quick to harden. Can be kept covered up to 3 days. I having been looking for this recipe for years. S relative of mine made these and they were my favorites! They called them ginettes? Also could you suggest what to use instead of sambucco? Not a fan of that flavor. Maybe limoncello??? Can’t wait to try them!!! I am so excited to try this recipe! The pictures look very much like what my mom used to make. I have tried to make chumells (which is what she used to call them) from her recipe but they never came out quite like hers. Your recipe has a few extra ingredients so maybe that is what I was missing. She did not use the glaze but the cookie itself was crunchy and a little sweet. Thanks for sharing your recipe!! Lisa you are the first person outside of my family to say chumellies and I have looked a lot…my noni also made them but just eggs flour sugar and oil. I make them all the time! Hi Shelly – I want that same taste as my mom’s. If you don’t mind, please tell me the amounts of flour, sugar, oil and egg that in your noni’s recipe. I have great memories of these sweet treats?